If you live in New York or even if you don’t, you’ve probably seen an ad for La Grenouille. With its particular font and style, you see it in the back of Playbills at Broadway shows. You see it in The New Yorker and sometimes in the New York Times Magazine section. Such blatant commercialism may cause you to unfairly dismiss La Grenouille as “a place for tourists” and if you do you’ll miss out on one of New York’s most beautiful and (relatively) historic French restaurants. Well, you get the floral effect but you lose the jewel-like quality. Anyway, it’s very pretty in there. However (first complaint!) the tables are a bit…difficult. There are large tables in the middle for large parties–usually six or more. And then on the side are banquettes that are tight squeezes and, much like at the Carnegie Deli, you’re required to basically eat on top of another family. It was a bit uncomfortable, but we got over it. The way it works is for the fixed prix of $87.50 you’re entitled to an appetizer, an entree and a dessert. You can order a la carte, but that would ultimately be more expensive. (Unless you didn’t want an appetizer or a dessert). The left side of the menu features classic dishes that are available year round; the right side seasonal dishes. You can choose from either side. “It’s cold,” said dad, kiddingly. I liked it, though it was the first foie gras I’ve eaten that was–in parts–a bit stringy. Wonder why that was? I realized a little too late that these were meant to be eaten with my hands. (The presentation of a finger bowl at the end clued me in.) But even with a knife and fork, I truly enjoyed them. They’re sauteed in garlic and crusted with flour so how bad could they be to start with? I hate to be cliche, but that old expression you always hear about things like frog’s legs proved true. “It tastes like chicken.” It kind of did. And they were both satisfied. This was the low point of the meal: nothing to write home about. 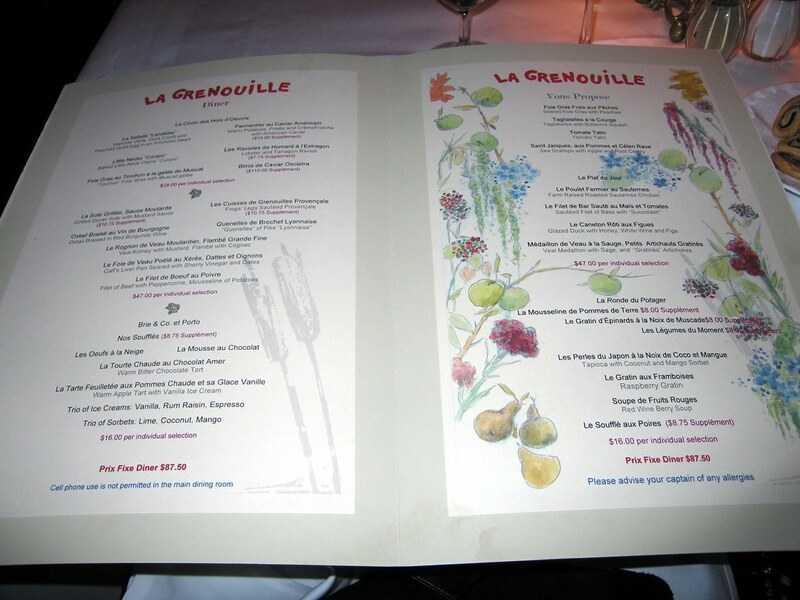 But all in all, the La Grenouille experience was worth having. The other French places in New York I’ve been to–Daniel, Le Bernardin, Jean-Georges–are all temples of gastronomy with modern flair. La Grenouille is a bit more of a relic: they’re not pushing any envelopes, but they’re serving up old world France with style and charm. Plus you get to eat frog. How often do you do that? 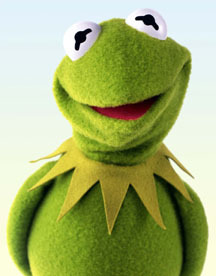 Quiet, Miss Piggy.